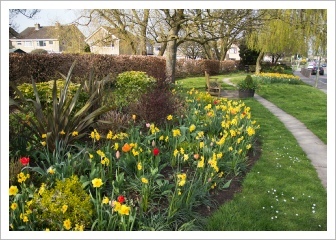 Prior to the Tetbury in Bloom committee being formed in 2005, the council tended the municipal beds throughout the town and planted them in the traditional “carpet bedding” style. 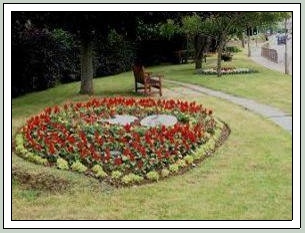 Following our success in changing the Knapp bed and Braybrooke Close bed to a sustainable mixed planting style, in 2006 we decided all the beds should be changed using colourful foliage shrubs and perennials so that there would be interest all year round. Over the years these have matured successfully and although they all follow a similar theme, they each have their own identity. The advantage of using sustainable plants is that during the winter, the evergreen plants maintain a framework and structure and from February through to May, whilst the long-flowering perennials are coming into their own, hundreds of crocuses, tulips and daffodils make a fantastic colourful display. 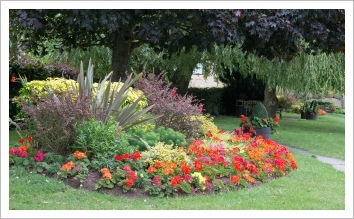 From June we add just a splash of bedding during the summer months to carry the colour throughout the season. 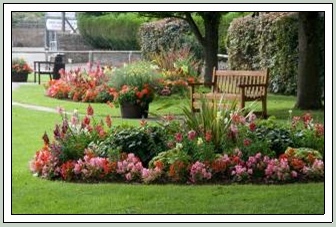 The pictures below show the same beds planted in the two different planting styles. 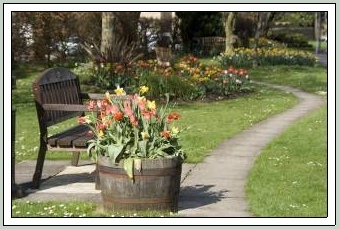 The sustainable planting still achieves a vibrant look which over the years is more cost, labour and water efficient.